Once upon a time, says Ayn Rand, the world was ruled by a combination of faith and force—by a conspiracy of priests and tyrants. The priests kept men under control by persuading them that the world was irrational, that their minds were impotent, and that the self-seeking pursuit of happiness was sinful. The tyrants kept men under control by the exertion of physical force. The Witch Doctor and Attila, to use Miss Rand's phrase, used and needed one another. The Witch Doctor supplied Attila with a coherent view of the world and human destiny, in addition to performing as opiate of the masses; Attila supplied the Witch Doctor with power and the material means of survival. Each hated, feared and envied the other. Together they kept mankind in a state of material poverty and moral degradation. Onto this scene of decadence strode the modern businessman and the modern scientist. The Renaissance "blasted the rule of the Witch Doctor sky-high, setting the earth free of his power." The industrial revolution, completing the task of the Renaissance, "blasted Attila off his throne." Finally, the Founding Fathers of America created the "first society in history whose leaders were neither Attilas nor Witch Doctors, a society led, dominated and created by the Producers." The social system which the Founding Fathers established was capitalism—not perfect, totally unregulated capitalism, but the nearest approach to that ideal the world had ever known. Capitalism, unlike the previous system, was based on the principle that every man existed for his own sake. It rewarded all men in proportion to their abilities and efforts, thus showing its moral superiority to societies based on the looting of Attila and the mooching of the Witch Doctor. Moreover, it achieved unprecedented material prosperity, for "when men are free to trade, with reason and reality as their only arbiter, when no man may use physical force to extort the consent of another, it is the best product and the best judgment that win in every field of human endeavor, and raise the standard of living—and of thought—ever higher for all those who take part in mankind's productive activity." Alas, the free businessman and the free intellectual Cwho replaced Attila and the Witch Doctor) fell out. The fault lay with the intellectual. The businessman did his part by achieving material prosperity, but the intellectual—who was supposed to supply an integrating philosophy explaining, defending and justifying the new society—defaulted on his role. Unable to leave the Dark Ages, he sneered at the businessman for his lack of aesthetic taste and bourgeois manners. Worst of all, he turned his back on the real world and insisted on preaching a philosophy which—whatever its form—denigrated man's mind, damned honest self-seeking and exalted self-sacrifice in the style of the Witch Doctor of old. As a result, Miss Rand continues, the businessman was made to feel guilty and came to fear and despise the intellect. The intellectual, who was really seeking a new Attila, found one in Socialism, which—as everyone who is not of the "Attila-ist" mentality will admit—led necessarily to Nazism and Soviet Communism. Today, the United States drifts aimlessly (without a firm, integrating philosophy) toward the Dark Ages. Philosophers teach us that man's mind is impotent; psychologists tell us that man is a helpless automaton. Our literature asks us to identify with murderers, dipsomaniacs, drug addicts, neurotics and psychotics. And in politics, our intellectuals tell us that "America, the greatest, noblest, freest country on earth, is politically and morally inferior to Soviet Russia, the bloodiest dictatorship in history—and that our wealth should be given away to the savages of Asia and Africa, with apologies for the fact that we have produced it while they haven't." This is the ultimate bankruptcy. But the New Intellectual will change all this by supplying the philosophy which others have failed to provide. Indeed, Miss Rand has already invented it. It is (she says) implicit in her novels—long and short passages from the novels are included in the book under review—and is outlined in the book's opening essay. A full presentation of her "new theory of the nature, source and validation of concepts" is under preparation. For the present, the essential points are (1) that the world is rational and knowable, and that the only way to live is to conquer nature through the exercise of your mind; (2) that man exists for his own sake, and hence that the only moral form of human cooperation is the exchange of goods and services on the free market; (5) that anyone who does not make a living as a Producer is either an Attila (who seizes goods and services from others by force), a Witch Doctor (who persuades others that they owe him a living) or also-like the great mass of us—one who fluctuates between roles. It follows from all this that anyone who preaches the moral value of unselfishness or self-transcendence is either a fool or a knave. It also follows that any use of governmental power to redistribute income, provide social security or unemployment compensation, construct and operate schools, or do anything which is not absolutely necessary to keep a "free economy" clear of force and fraud, must involve some form of legalized robbery. One does not need the photograph on the book jacket to know that Miss Rand is a woman beset by a vision. I cannot personally approach the intellectual apparatus by means of which she implements that vision without a snort or a cry of outrage, but I do have a semi-articulate response to her work, considered as an object of cultural and social history. We do not lack thinkers of substance on the intellectual Right. Men like Frank H. Knight, Wilhelm Ropke and Bertrand de Jouvenel are no mean antagonists for any would-be anti-capitalist. Authors of this type, however, are generally distinguished by their commitment to responsibility, their feeling for the limitations of their positions and their insistence on grappling with living problems. All of them write on an entirely different intellectual level from the one occupied by Miss Rand. 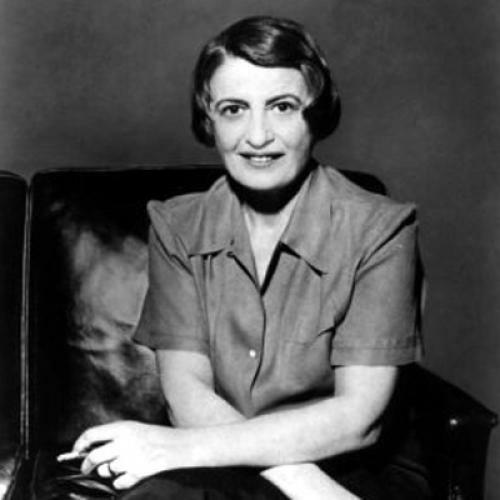 None of them would indulge in her sophomoric analysis of the history of Western philosophy or her attempt to show that the difference between a capitalist and a socialist is one uniquely dependent upon epistemology. On the other hand. Miss Rand is not to be classed with the members of the John Birch Society. If her philosophy is largely pretentious nonsense, it is still important enough to her to warrant a laborious, relatively coherent development of the "psycho-epistemology" which she attributes to her three "archetypes" (Attila, the Witch Doctor and the Producer). Of course she straightway treats it as the Key which unlocks all Mysteries, in a manner reminiscent of the more vulgar Marxists toward the theory of economic determinism. Rudimentary as it is, the Rand system provides a viewpoint on the essential meaning of history and the significance of current events, as well as a rough guide to personal morality (of a sort). There is just enough truth about unprovable matters in its major assertions to make adherence by self-respecting persons possible, for awhile. Best of all, like other similar systems, it supplies a coherent set of "answers" which can never be shaken by mere argument (since every situation can be defined so as to fall within the terms of the system) and a stout forensic stick with which to beat fellow intellectuals who have not as yet seen the light. There seems little likelihood of an expanding future for Miss Rand's system or her following. The irreligious, or even anti-religious, character of her position cuts her off from a number of right-wing groups whose support she might otherwise enjoy. The same factor probably bars her access, in the foreseeable future, to any mass following. She or others like her will be around, however, as long as there are non-religious intellectuals on the Right who feel the need to see politics and life in terms of one rigid and all-embracing dogma.